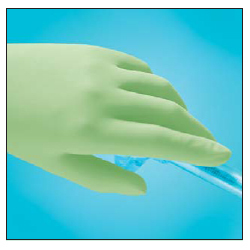 The Derma Prene® IsoTouch™ surgical glove is powder-free and made from synthetic polyisoprene. The glove delivers all the performance characteristics of natural rubber latex without the risk of natural rubber latex sensitization. The Derma Prene® IsoTouch™ is light green in color for instant identification as a natural rubber latex–free glove, which helps to reduce confusion and risk to both healthcare workers and patients with sensitive skin.